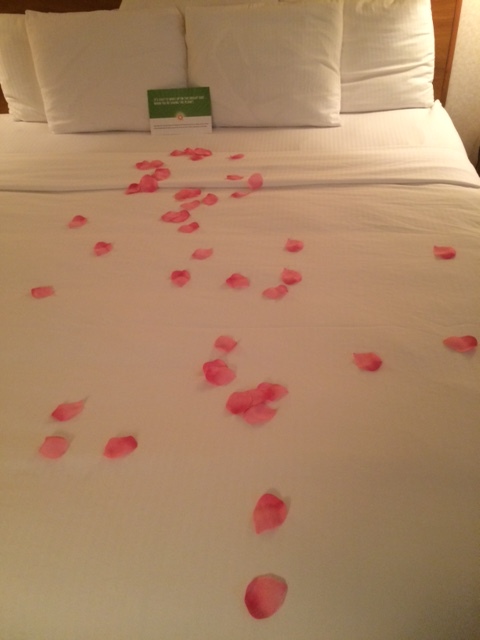 Have you ever wondered if the hotels pay attention to your special requests that you make when booking a room? But, to tell you about that keep in mind, I have to tell you about the last day of my trip first. I know, that’s back word’s from how a person normally tells their story, but am I normal? Wait don’t answer that. We had just spent a very long day on the road Monday driving from Hershey Pennsylvania area to Auburn Indiana. We went in to sign in and find where our room would be before we went to look for lunch. I sent the boyfriend (:)) out to read the plates on the car, and the registration lady leans over the desk and whispers, next time you have a request like that call and verify it with us. Everything got taken care of, but we just saw the request. I have a puzzled look on my face, not really remember the request I made, or why I made one. The lovely boyfriend came back inside we got our key and we headed up to the room. As soon as I opened the door, I saw what the lady meant. 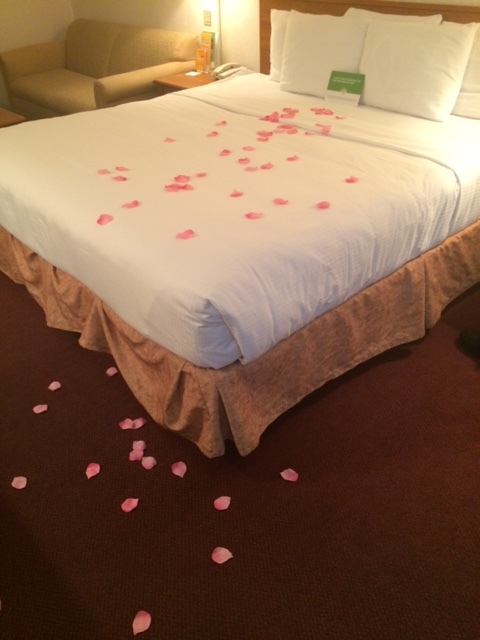 There were flower petals on the floor leading to the bed! I, in my quest to see if they hotels really pay attention to the special requests, requested for a romantic room. This is what I received. Naturally, I smiled and was excited and had to bring a few home with me to remember. Anyway, this is all I have time for today, stay tuned over the week to hear more adventures, including Knoebles adventures (amusement park), Hershey vs Wilbur chocolate arguments, and toy show extravaganza! Moving, Licensed, and Vacation Oh my! It took about 3 complete days to seriously pack everything in a manner to which we would still be able to identify it later. And it took a matter of slightly less than 2 hours to pack everything into the moving truck. The hardest part was driving to the new location. Let me explain that. We had this ginormous plant in the office. My boss said it was given to her after her parents passed. Which means it has been growing for some 10 years. Anyway, this thing is out of control huge, and it was my front seat passenger. Every time we came up to a stop sign, I had to snake my hand around to find the absolute front, then squish it back so I could see out the right side. And of course most of our turns were left hand turns, so I had to see if anyone was coming from the right. Anyway, we made it through town and I managed to make it onto the interstate. At this point, I should point out that I was the caboose. The rear end. The last in the line. The moving truck went a max of 45 on the highway, not because that’s how fast my boss felt comfortable, but thats how fast the moving truck went. No faster. So here I am in the rear consciously not letting myself look in the rear view mirror, because I would rather not know when someone was going to smash into me for going so slow. Anyway, we got about half way and IT STARTS POURING AND LIGHTNING!! Perfect day to move as it turns out, I know. So, we finally get to our new location, we all climb out of our various cars and head for inside. We wait about 10 or 15 minutes for the storm to die down and the rain to subside before we move everything in. In the mean time, the carpets are still in the midst of getting cleaned! For a work day, it was exciting, unique, and I’d love to do it again :). The unpacking has commenced, even though I still do not have a receptionist desk. I’m working off of a folding table currently. It’s a long one though, so it works quite well for me. I’m in the process of figuring out what I want my reception area to look like, while also knowing that in a week or so when the actual desk comes in, that it will look completely different yet again. I finally applied for my producer license with the state of Illinois. the important part here, it was ACCEPTED! I am a fully licensed producer for Life and Health insurance in the state of Illinois. I’m just waiting on my license to make it to me :). I started this job at the end of July in what seemed like a flurry of activity. I literally went from one job to the other. On a Wednesday in July, I finished my job with the hospital and on that Thursday I started my job here. I could not have asked things to work out any better than they did in the transition, or since. In fact, in 2 days I go on vacation. yup you read that correct. I get to go on vacation. I mentioned to my boss ahead of time in the interview process that I had a vacation planned before I decided to switch jobs. My taking this job was contingent on still being able to keep this vacation time. It is the first vacation with my boyfriend after all. The first of many I hope? There is nothing more telling of what a person is like than being on the road with them, which makes me a little afraid! and yet very excited for this trip to Pennsylvania. With that being said, stay tuned to hear alllll about the excitement, travel and experience in the coming week. 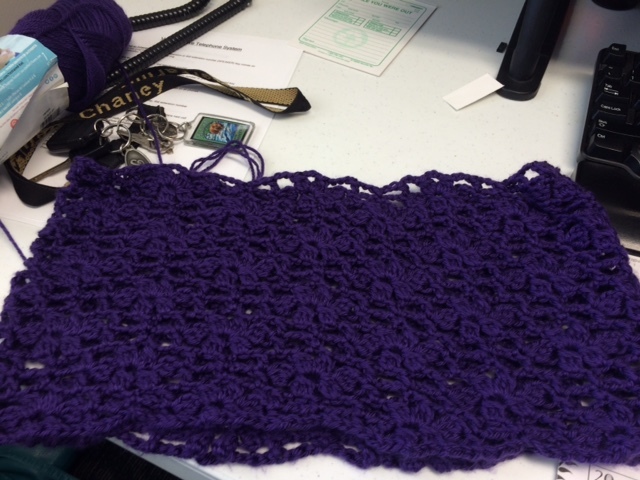 <—- The shirt I am currently working on for a customer. First, I passed the Illinois Life insurance and Illinois Accident/Health Insurance producer exams!! That means I have just one hurdle left, applying for my license, before I’m a producer with the state of Illinois. Now, I know it has been forever since I last posted, and I’m sorry. Please forgive me and over look this indiscretion. That being said, I have been busy! From studying for and taking the producer test, to packing the office and sending out emails for my boss on renewals. From, spending time with the family (and boyfriend!!) to spending time working on my own business, this month has been full! Speaking of my own business. I had an email requesting a shirt. Now, I had just taken down my etsy site and come to terms with the fact that I might not ever sell anything beyond family. I suppose one should never give up on themselves though. I quoted a price for the shirt, it was accepted and I’m currently in the process of completing it :). As for spending time with family and the boyfriend. I convinced the boyfriend to go with me to my Grandma Jackson’s on Labor day. I was not entirely sure what to expect or how much family would be there, but I gave him as much of a heads up as I could knowing what the make-up is usually like on holidays (or use to be as it seems I can never quite make it there on holidays anymore). It was a pleasant surprise when the boyfriend fit right in! no complaining, no wanting to leave early, no scared look on his face. He even wondered off and got to talking with one of my uncles on his own. In fact, after words he even said it reminded him of his own family. 🙂 I think he’s a keeper folks. Oh, and the family enjoyed having him there as well, I think? This month is not over yet, and it is only projected to get busier. In exactly one week from tomorrow the boyfriend and I will be leaving on vacation! We are headed to Pennsylvania, the real purpose is the toy show they have, but I have made a secondary purpose of seeing Hershey Pennsylvania a priority as well ;). Any advice on where to get quick bites to eat on the way to Pennsylvania from Illinois????? Ah well, Time to get back to packing the office up, we move the office on Friday!!! Thanks for being patient and waiting for the next blog entry. I enjoy being able to write out what I’m doing, even if no one reads it;). if you have suggestions for what you would like to read about in this blog, do not hesitate to let me know.